Based on the best-selling book by Chris Van Allsburg, the story centers on two young brothers and the mysterious game that they find. In playing it, they and their house are launched into outer space and numerous adventures. Pressman's game is a replica of the one seen in the film and has many of the same features. Turn the key and a game card pops out. A robot moves along the board to slow you down. Eventually, the house puzzle comes apart. 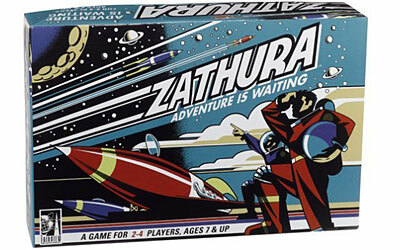 Be the first to reach the planet Zathura and win.